A Double Celebration for Christos! It was a snip! Christos Hair Salon have been overwhelmingly voted Newport Pagnell Independent Shop of 2015 by their devoted customers. Mark & Tina Periclis, owners of the salon were over the moon to hear that they had won the accolade and the recognition is particularly special, as 2015 marks the 50th anniversary of the setting up their business. 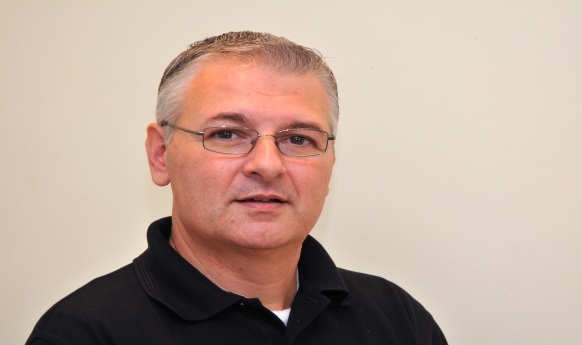 Mark’s father, Christos, started the business in 1965 and the world of hairdressing has changed beyond recognition since. 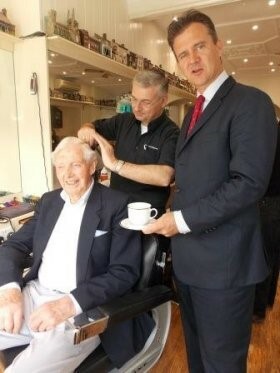 Today’s salon is a constant hive of activity and the commitment to customer service is second to none. They have adapted their business to meet the needs of today’s busy client and keeping ahead of the fast moving techniques and trends has put them at top of their game. The salon has also been working in partnership for the past 2 years with both MK and Bedford Hospitals and MacMillan to offer a unique and personal service to cancer patients and those who suffer with alopecia in their private first floor salon. As an advocate of our local independant shops, I was so pleased with the fantastic response to this campaign as it gives customers the opportunity to be able to say thank you to their favourite butcher, florist, grocer, or whoever it maybe. It’s Enough To Make Your Hair Curl! On meeting up with Ro, I learnt that he had been a customer at Christos for over 30 years, in fact he used to pop into their first shop in Wolverton when he was working as a truck driver in the steel works. The family legacy continues on as Luke, Ro’s grandson, is already a regular customer at Christos and is delighted to learn that his granddad is willing to share his good fortune! Here at Christos our team of bridal experts believe that every bride is unique. 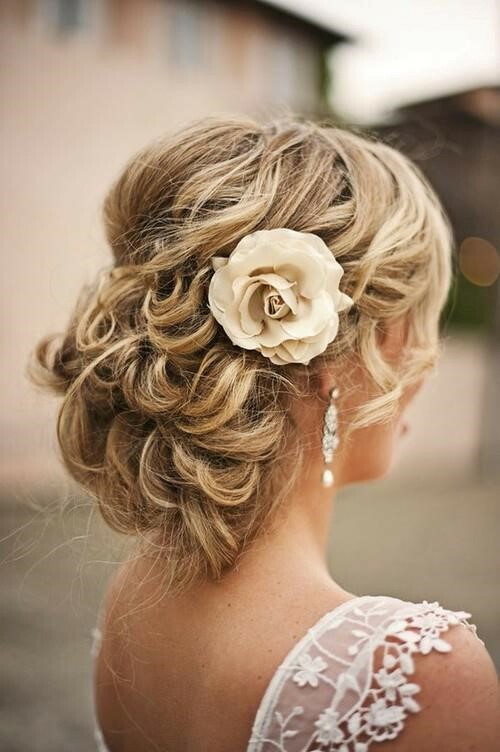 Because of this we create a bespoke package to suit your entire bridal party`s hair and make up needs. We offer a home service so if you prefer we can come to you, great if your short of time. Step 1: CONSULTATION: this includes a FREE half an hour appointment with one of our Wedding Consultants about the Brides wishes for the big day. This will include, any extras, for example colours, cuts and condition to prepare the hair for your big day. We then recommend booking in for a trial with one of our stylists. Step 2: TRIAL: £35 (per hour). Firstly we look at any images you may have found, then we can try out different looks to achieve your end result, we also encourage you to bring with you any additional headwear or accessories you wish to wear. We can also discuss your wedding entourage, bridesmaids, mother of bride and guests. Make up trial: £35 (per hour). We will complete an individual bridal hair care plan for you, please feel free to photograph your hair and makeup trials with us. To suit your needs on the day, we offer an in salon or out of salon service. To travel to your wedding venue or home, there will be charge an additional £50.00 to cover costs. Christos Hair Salon Now Recruiting a Salon Co-Ordinator. Full time position, job share considered. Working with a team of 20 Stylists in a very busy hair salon. Objective – The role is to continue to develop a valuable link between our clients and our technicians. Goal – Create sales and maintain the highest standard of positive client relations. Would Suit – Responsible, competent, trustworthy individual with a friendly professional disposition. Superb people skills and mature communication skills are essential. The successful candidate will be task orientated, organised, neat, tidy and effective. They must have a clean and professional image. Salon experience preferable. Front of house – implementing all front desk procedures and policies in a consistent effective manner. Management of a busy diary to maximise appointments and benefit non appointment clients. Salon Maintenance – Maintain the cleanliness of the salon at all times and assist in salon clean-up. Take part in scheduled deep cleans of the salon. Salon Support – Support all of the technicians with their appointments, working alongside the stylists, prepare for client appointments including filling out record cards, filing and organising client information. Inventory – Order and count stock, display and merchandise retail areas. Implement and promote special offers with the salon. Communicate – Meet with General Manager weekly to update and raise any client concerns. Communicate with all salon personnel on issues relating to then ensuring client requests are the priority. Good rate of pay and generous holiday allowance. Please contact Joan on 01908 611277 for further details or send us your CV FAO Joan, Christos Hair Salon, 74c High Street, Newport Pagnell. MK16 8AQ. 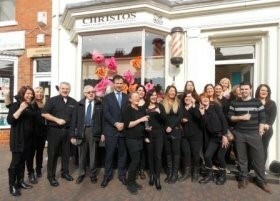 The Christos Hair Group of Newport Pagnell has an enviable reputation for providing professional hair design and hair care services, advice on hair and scalp care and products for everyone. 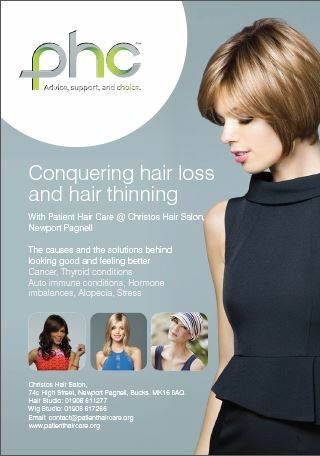 The newest addition to the Christos Hair Group is Patient Hair Care, having teamed up with our local Macmillan Unit in Milton Keynes Hospital; we are providing their patients with not only a wig service but also providing them with hair and scalp care through all stages of their treatment. At Christos Newport Pagnell we specialise in all aspects of hair loss and hair thinning, from Alopecia to medical induced hair loss. We put together hair care plans to suit the individuals needs going forward with their hair care treatment. 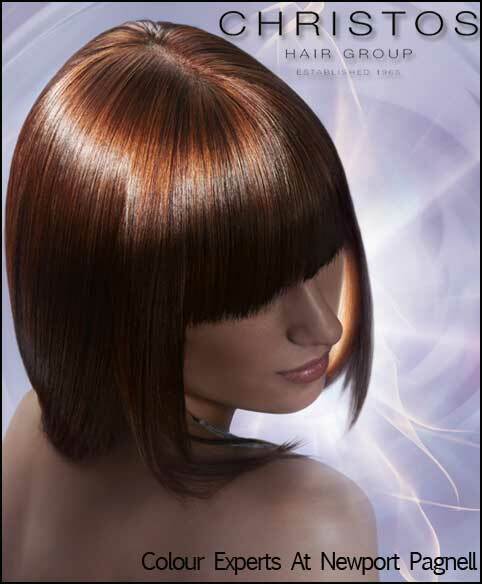 Our highly successful salon with 26 top stylists and support staff has been established for over 40 years. We pride ourselves in giving the highest level of customer’s service and providing a friendly and relaxed environment.